Good morning my bookish friends. As most of you know, I have incredibly eclectic fiction reading tastes and enjoy thrillers, suspense, mystery, romance, historical, YA, classical literature, literary fiction, etc., so needless to say I jumped at the opportunity to host a visit from the acclaimed thriller author Gary Grossman. Then I learned that he taught at Emerson College (Boston MA) and that just ramped up my enthusiasm even more (I attended Emerson for my Freshman year many, many years ago). So sit, back, relax, and learn a bit about Mr. Grossman's writing process and the adaptations he's had to make as a result of recent world changes. Thank you, Mr. Grossman, for taking time out of your busy schedule to visit and share with us today. HOW I SEE IT AND WRITE IT. I'll start off with what I used to do. As a journalist, TV documentary producer, and novelist, I would begin each day reading the LA Times, watching local TV coverage and national and international cable news, and listening to talk radio on the way to work. I'd think about where we were going today and consider why the things that were happening were actually happening. I'd ask myself, "Why Today?" That approach often led me to create television documentaries that were based on what we knew and where we were going – both historical and relevant stories. It worked for years. But on September 11, 2001, the unthinkable replaced the historic and the predictable. Now, there's hardly an hour or a day without a significant surprise. I think we can all agree that revelations, rumors, leaks, whispers, and testimony constantly take us to new territory. As I evolved from documentary producer to thriller novelist, I realized I had to adjust my way of thinking to more than just staying ahead of the curve. I had to anticipate how sharp and unexpected those next carves were going to be. Along the way, I decided I was writing in a new genre, a fiction genre I call political reality. Here's how I've done it as the author of EXECUTIVE ACTIONS and the sequels EXECUTIVE TREASON and EXECUTIVE COMMAND, and in my geographic thriller, OLD EARTH. I take a three-level approach. As a matter of fact, I recommend this for anyone writing thrillers and for readers trying to figure plots out ahead of the characters. I start with known knowns. They're the things that we do know. They're in the news or certainly within grasp of my characters and the experience of readers. Known knowns are the firm ground we walk on. The familiar. They're the dramatic hooks; the way into the action. Then it's time to change things up, to challenge the characters and readers, and take the plot into the realm of unknown knowns. Simply put, unknown knowns are the things that we may see happening, but the characters don't. Or they don't make complete sense yet. Here, readers are often ahead of the characters in the plot encouraging them to discover the unknown knowns. Just when they do, I shake things up again. Time for the unknown unknowns. These are major red herrings, twists and turns; surprises for both the readers and the characters in the book. What I love about constructing an exciting plot based on this approach is that the unknown unknowns are there to be researched and discovered. They are real or about to become real. We just might not know about them yet. But we better. For EXECUTIVE ACTIONS, it's recognizing that Cold War Russia's school for training sleeper spies to pass as Americans still has long roots. REAL. Well-funded plots sponsored by both rogue nations and American businesses are aimed at drastically changing American politics. REAL. Manipulation of markets, media and people move these diabolical plots along. REAL. And the public's belief that most of it's not possible is the ultimate danger. EXTREMELY REAL. Unknown unknowns until it's too late. The plot of EXECUTIVE ACTIONS weaves through the three categories starting with we what know and climaxing with a scenario that very well could be just around one of those curves. The great fun in the reading is the same fun I had in the writing. The characters take over. Secret Service agent Scott Roarke really does learn along the way. He meets Boston attorney Katie Kessler, not because I outlined her role, but because he needs a smart, dynamic woman to help him. He's up against a masterful assassin who constantly stays one step ahead as he delves into the life of Teddy Lodge, a charismatic congressman, who runs a brilliant political campaign. They emerge and converge in a story that begins with knowns – news that we can all recognize and figures that seem relatable and reliable. And then EXECUTIVE ACTIONS kicks into gear, exploding from what we do know into the other realms. I'm not painting a picture of an alternate reality, though it's fiction. It's the political reality of tomorrow…or maybe even later today! You decide. I hope my writing approach works for you. It's driven with a fast-paced cinematic style. Lots happening simultaneously. Things to figure out. So, let me know what you think. I'm reachable at gary@garygrossman.com, www.garygrossman.com, or via Twitter @garygrossman1. 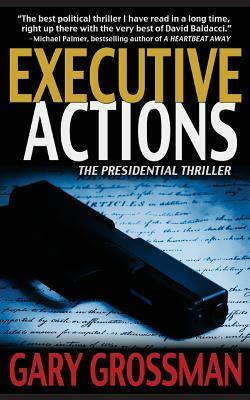 "Executive Actions is the best political thriller I have read in a long, long time. Right up there with the very best of David Baldacci. [A] masterpiece of suspense; powerfully written and filled with wildly imaginative twists. Get ready to lose yourself in a hell of a story." "Break out the flashlight, and prepare to stay up all night … Once you start reading Executive Actions you won't be able to put it down." "Executive Command mixes terrorists, politics, drug gangs and technology in nonstop action! Gary Grossman creates a … horribly plausible plot to attack the United States. So real it's scary!" "Moving at break-neck speed, Executive Command is nothing short of sensational … Executive Command is not just a great book, it's a riveting experience." "Executive Command ramps up the excitement … A truly bravura performance from a master of the political thriller!" "Intricate, taut, and completely mesmerizing. Grossman expertly blends together globe-spanning locations, well-researched technology, finely crafted narrative, and intriguing characters to create a virtuoso tale. Highly recommended." "Executive Treason is more chilling than science fiction … You'll never listen to talk radio again without a shiver going down your spine." Grossman has worked for NBC, written for the Boston Globe, Boston Herald American, and the New York Times. He is the author of four best-selling international award-winning thrillers available in print, eBooks, and Audible editions: EXECUTIVE ACTIONS, EXECUTIVE TREASON, EXECUTIVE COMMAND and OLD EARTH. (Diversion Books, NYC) and two acclaimed non-fiction books covering pop culture and television history – SUPERMAN: SERIAL TO CEREAL and SATURDAY MORNING TV. Grossman taught journalism, film, and television at Emerson College, Boston University, and USC and has guest lectured at colleges and universities around the United States. He currently serves as an Adjunct Professor of Film and Television at Loyola Marymount University in Los Angeles. He is a member of the Board of Trustees at Emerson College in Boston and he serves on the Boston University Metropolitan College Advisory Board. He is a member of the International Thriller Writers Association and The Military Writers Society of America. WOW! What a great post! I have this on my TBR list and after reading this post, I 'm moving it up in my pile!